PanLbilt offers customized Storage Reservoirs with a Potable Water PVC liner that insures fresness of the water and protection agains the elements, insects, sand, algae and bacteria. The Customized Tank is designed to stand up to aggressive wind loads in specific regions where hurricanes, high winds and thunderstorms occur regularly. The tank shell can be adapted to your specific needs, we can adapt the wall sheet thickness, roof sheeting and truss design for an even more durable structure when nature comes thundering down. the coating provide a tough physical barrier between the extreme atmospheric conditions and the inner core steel. Zinc has inherent sacrificial properties and corrodes first before the mild steel corrodes. to avoid insect and dust contamination. All commercial and industrial water storage tanks require the construction of a concrete ring beam footing. It is imperritave for the client to ensure that the foundation and civil works for the site are adequate. Ring beam design is dependant on the tank size and location. This high quality panel-type reservoir is a modular steel tank storage solution that bolts together for easy installation. A certified potable liner with woven base fabric polyester yearn ensures safe water storage for drinking. 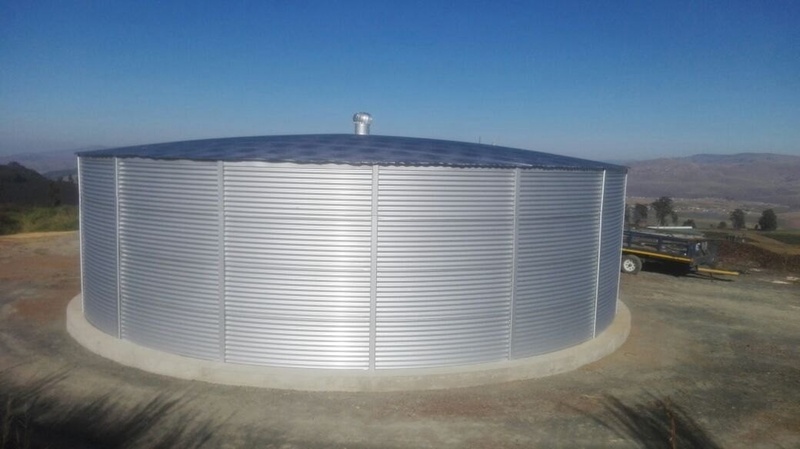 With capacities ranging from 16m3 to 3 100m3, these steel coated panel tanks are available in a multitude of design specifications depending on the client’s requirements, ranging from 3,0m x 2,34m high to 22,28m x 8,18m high. quickly by a certified installer, even in difficult or remote sites anywhere around the world. Floating, solar powered, circulation equipment for potable water reservoirs. Day/ night operation on solar only by utilizing a battery to store excess daytime power for nighttime operation. 316 stainless steel construction. Foam-filled high-density polyethylene (HDPE) floats. Thermoplastic rubber intake hose. HDPE strainer. The SB500PWc is NSF/ANSI Standard 61 Listed, includes NSF/ANSI 61, Annex G.
80-watt PV solar panel. Battery storage for day/night operation. Digital, solid-state controller, mounted in weather-tight (NEMA 4X) enclosure with internally fused disconnect. SCADA output through RS-232 Serial Communication (Modbus RTU), DB9 male connection point inside enclosure. Three floats in triangular pattern with total float buoyancy of 300 pounds (140 kg).